Our goal is to draw out each coffee bean’s unique character and attributes during the roasting process. 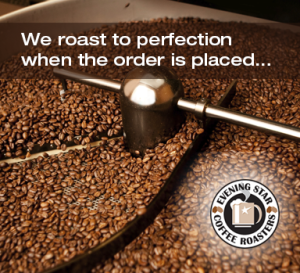 We consider roasting an art that is performed with a passion for perfection. If the roasting time is too long, the coffee will taste “dark” and burned, while coffee that is roasted for too short a time will lack flavor. At Evening Star Coffee Roasters, we roast with our eyes, ears, and nose (no computers or digitization processes with pre-set computer logic). We look for all the key signs, smells, and sounds of a perfectly roasted coffee. When the coffee reaches optimal flavor, aroma, and body, we stop the roasting process and discharge the beans into a cooling bin. We firmly believe that a hands-on approach to roasting guarantees freshness and consistency across all roasts. A hands-on approach allows for complete control of the roasting process when unforeseen variables arise. These variables are situations and occurrences that a computer or a digitization process would not be able to detect thus sacrificing the quality of the roast. Our goal is to roast to perfection! It is important to properly store your coffee. 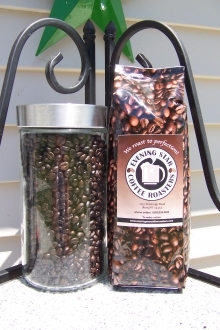 Evening Star Coffee Roasters recommends that you store your coffee in a dry, clean, glass air-tight container once the coffee package is opened. To maximize the flavor of coffee it is best to minimize its exposure to air, light, moisture and heat. Storing your coffee in a cool dark place helps to keep the coffee fresh for optimal flavor. A pantry, kitchen cabinet, or basement pantry is an excellent storage area. We recommend a glass container because it is the easiest type of container to clean. Refrigerator Storage– Coffee will absorb flavors from other stored food products. Condensation from the refrigerator will also degrade the coffee as the refrigerator is opened and closed. Freezer Storage– Condensation will form on the beans thus negatively affecting the taste quality. In addition, numerous oils on the coffee will dissipate thus negatively affecting the coffees flavor. Plastic Container Storage– Plastic containers may import a plastic taste into your coffee. Plastic container may also absorb oils and gases that help to give coffee its wonderful flavor. 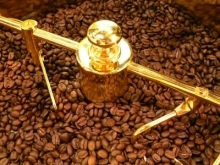 Story 1 As one story is told 12 centuries ago in 850 AD, an Ethiopian shepherd by the name of “Kaldi” was believed to be one of the first people to discover the effects of coffee berries. As he tended his sheep, he noticed their hyperactive nature as they appeared to dance around a large evergreen shrub full of bright red berries. Kaldi noticed that these sheep had eaten the bright red berries from the shrub, so he decided to try them himself. Soon after eating these berries, he also became very alert and full of energy. Kaldi’s wife noticed a big change in his energy and advised him to share his findings with a local monk. The monk advised Kaldi to avoid the berries and stated that they were not of Allah. Soon after, the monk used the fruit and shared it with the other monks at the monastery. The berries were proclaimed to be miraculous and were used to keep the monks awake for prayer late into each evening. Story 2 A second story originates around 1000-1200 BC. It is about an Arabian legend by the name of Omar the Dervish. Omar was recognized for his abilities to cure the sick and injured through prayer and medicine. His miraculous abilities were not accepted by all, and he was forced into exile away from the Yemenite port of Mocha. He was instructed to never return, so he wandered the desert outside of Mocha and lived in a cave. During his exile, he came upon a shrub and believed it to be a sign from God. He ate the hard berries from the shrub and found them very distasteful so he decided to build a fire, roast the berries and place them in boiling water. Later, he drank the water, and he was immediately full of energy, strength, and hope. This sustained him for a number of days. Word of his energy and hope broke to the nearby communities, and soon a number of pilgrims made the journey to Omar’s cave. Omar welcomed the people and served them the beverage of “coffee” as they prayed thanks to God. Many of these people were cured of their illnesses, and soon he was welcomed back into the city he loved. He later became a saint for his miraculous brew. 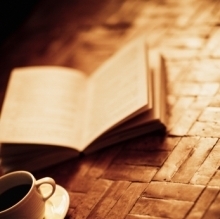 Summary These stories represent the birth of the “Qahwah,” which is the name for “coffee” in the Arabic language. Qahwah is defined as “invigorating and stimulating.” In the first story, the coffee berries were consumed whole. In the second story, the coffee berry “juices” were consumed as a beverage. As one tries to learn the true origin of coffee, a number of stories and history texts show unique variations of the two stories recounted above. We can only guess as to coffee’s true discovery. One would have to agree that the truth lies in the hands of a Higher Power. What makes a perfect cup of coffee? There is no right or wrong answer to this question The answer lies in the eye of the beholder. For me, it comes down to “cupping.” I look for specific taste, flavor, and aroma qualities that stimulate my mind. If through cupping analysis, I am thrilled with the result, I will go forward with offering the coffee to my customers. If during cupping, I find the coffee to be less than the very best, I go back to the “drawing board.” This is where I do additional testing. I do this frequently with every coffee we sell. Testing gives me the confidence that we have the best product on the market. Most roasters can’t say they do that! This is why I stick to a limited quantity of coffee types. I feel my offerings promote a manageable operation where I am able to cup the products on a daily, weekly, monthly, or as-needed basis. The larger local and commercial roasters that sell 20-40 different roasts can’t say their focus is on the results of cupping! How do they find the time to test quantities in that size? They generally don’t. As a result, the consumer is the one that tests and tastes the result. Summary The best way to answer this question is to recommend that you define a perfect cup as one that tastes, smells, and has an amazing flavor to you – regardless of what everyone else thinks. If you love it, then it’s a winner! 1. Robusta: Coffea Canephora Robusta accounts for approximately 24% of the world-wide production of coffees, and it is grown at altitudes between sea level and 3000 feet. These coffees are exclusively grown in the Eastern hemisphere and thrive in equatorial climates at low altitudes. It is a very hardy and disease-resistant evergreen bush that blossoms throughout the year. Typically, Robusta is a bitter berry to the taste, thin in body, and very pungent. It contains double the caffeine of the Arabica berry with higher amounts of soluble acids. These berries require less care since they remain on the tree after ripening. The bushes are able to be harvested within 2-3 years after planting. Robusta is typically used for the creation of espressos and blends to add body. It is a popular coffee used by large manufacturers who can coffee for mass production. It is also popular for manufacturers that produce instant coffee for packaging. 2. Arabica: Coffea Arabica The Arabica species is named after those indigenous to Arabia. It accounts for approximately 76% of world-wide production and is grown at elevations between 2000 and 6000 feet (high altitudes). These coffee evergreens grow in semitropical climates near the equator, both in the Eastern and Western hemispheres. The maturing process of the coffee berry is slow because of the cooler temperatures at these elevations, which produce a smaller, more flavorful berry. Because of the great care that must be taken in all stages of growth, harvest, and processing of the Arabica berries, it is more expensive than the berries yielded by the Robusta plants. Because the ripe Arabica berries fall to the ground and can spoil, they must be carefully monitored and harvested to ensure freshness. These coffee bushes provide a berry that has a bright and sweet taste with a well-balanced aroma. 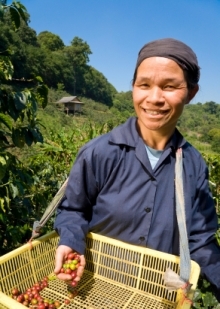 The Arabica bushes are able to be harvested within 4-5 years after planting. Specialty coffee shops typically serve Arabica because of its high quality and taste attributes. These berries make up the majority of Evening Star Coffee Roasters product mix. – Flavor is light bodied. Often referred to as the cinnamon roast. – During the roast process, the beans crack and double in size. This is typically where high-volume packaging manufacturers stop the roasting process for packaging. This is at approximately 8 minutes into the roasting process. – Dry surface but slightly shiny as the oils start to come to the surface. – Weight of the bean is lighter than the mild roast. – Full bodied and balanced with complexity. Rich and pleasant aroma. – The beans are 9-12 minutes into the roast. – Weight of the bean is lighter than the medium roast. – Rich chocolaty body, varied spiciness, and smoky aroma. – The beans are 12-14 minutes into the roast. – This is when the second crack occurs. – Weight of the bean is lighter than the dark roast. – The beans are 14+ minutes into the roast. – This is when beans become quiet and begin to smoke. – The bean sugars begin to carbonize. Full City- Has patches of oil on the surface of the bean. Darker than City High. • Coffee Production 4,500,000,000 lbs. • Coffee Production 1,500,000,000 lbs. • Coffee Production 326,000,000 lbs. • Coffee Production 205,000,000 lbs. • Coffee Production 506,000,000 lbs. • Coffee Production 160,500,000 lbs. • Coffee Production 616,000,000 lbs. • Coffee Production 350,000,000 lbs. • Coffee Production 189,000,000 lbs. • Coffee Production 1,034,000,000 lbs. How do you define and cup coffee? Coffee cupping is defined as a technique used by coffee evaluators to study its aroma, flavor and taste properties. It is a systematic tasting of roasted and brewed coffee samples. Coffee is cupped for three distinct reasons. 1. To note or find defects in a coffee. 2. 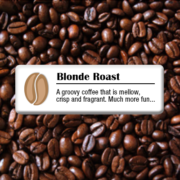 To create blends (a combination of several roasts to create a blend of coffee). 3. To gauge a coffee’s qualities and character. Step 1– For cupping of coffee Evening Star Coffee Roasters uses four 6oz cups per coffee type to be tested. They are presented in a square manner. At the top left in one cup is a sample of the roasted coffee un-ground. At the top right in a cup is a sample of the green bean coffee. These will remain covered until after the cupping session is concluded. Next place two tablespoons of freshly roasted coffee in each of the other two 6oz cups. The grind of this coffee should be between French Press and Drip setting. The coffee should also be lightly roasted. By keeping the roast light we can fully evaluate the coffee for defects. It allows us to study the aroma and sweetness that are often burned off by many of the darker roasts. We will want to do the four cup set up for each coffee type that is being tested. It is recommended that a minimum of four types of coffee are tested during each session. Step 2- Next, it is important to boil enough water for the testing. Keep in mind for each coffee type you are testing it will require approximately 10oz of boiling water. Therefore, if you are testing five different coffee types you will need approximately 50oz of boiling water. For testing purposes we use a commercial grade coffee brewer for the fresh boiled water. A few other things you will need are a spitting cup, spoons, pen/paper for notes, and a napkin for each person doing the testing. We recommend that you set-up the spoons in a cup that you will fill with boiled water. The goal is to keep the spoons at the same temp as the water when you are cupping. A cold spoon can change the parameters of the test when it is started. Step 3- Evaluate the Fragrance and Aroma of the coffees to be tested while the water is boiling. When everyone is ready and waiting for the water to boil each person should smell the grounds of each coffee type they are testing. Here they will want to make notes and write their comments down. Fragrance is what they are going to be writing about. Step 4- When the boiled water is ready, the water should be added to each of the bottom two cups for each coffee testing station. The boiled water will also be added to the cup that holds the spoons. Each person should smell each cup that holds the coffee and boiled water without disturbing the cups. Here they will want to write comments down about the coffee Aroma. Step 5- After 2 minutes have passed, it is important to break the crust of the coffee using one if the heated spoons. It is important to put your nose directly over the cup as you push the coffee down. This is where you will notice the most powerful scent of aroma. Here you will want to make notes on your evaluation of the coffee aroma. As the crust is broke, stir the cup to ensure all the coffee is covered in water. This is where you will add more notes on your evaluation of the aroma. When you are done with the one sample coffee cup (only one) move to the next coffee sample and do the same. It is important to rinse the spoon in the boiled cup of clean water where the spoon was initially gathered each time a new coffee is tested. After evaluating the aroma of all the samples, it is important to scoop all the grounds out of each testing cup before testing the coffee for flavoring. Step 6- The next step in cupping is testing the Flavoring of the coffees to be tested. Once the coffee is cool enough to test and to prevent burning of your tongue, take some coffee into a spoon and slurp the coffee over your tongue from each coffee station. Aspirating will cause droplets of coffee to pass into the throat and into the nasal passage. As the coffee passes into the nasal passage a wide array of flavors will immediately become present. It is important to write down what you experience with flavor, as a lot of flavors will become evident. Here some of the qualities you are looking for are body, aftertaste, acidity, and taste. Once you test one station move to the next until all stations are completed. If you are cupping several coffees, it is recommended that you spit out the coffee after testing it. When cupping several coffees it important to watch you caffeine intake as it can affect both your health and cupping ability. The important thing with cupping is to recognize that everyone has a unique opinion and that no one opinion should be considered right or wrong. Each person is working to find the qualities they like and to recognize defects in coffee that is being tested before it reaches packaging. A variety of methods for cupping coffee are used in the industry so note that one person’s method for cupping may be different from another. It’s also important to remember that the goal is to learn something new about the coffees you are testing and to enjoy the process of cupping. Make sure to have fun and laugh through the process as you become cupping experts. A variety of methods are available for consideration. In my opinion, the best methods of attaining the best tasting cup of coffee are through the Drip Brewing system or the French Press method. A. Drip Brewing System This method is the easiest method for extracting flavorful coffee on the go. It is quick and convenient. 1) Purchase only fresh roasted coffee. 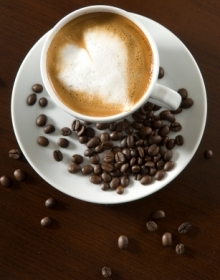 When coffee sits unused, it loses its freshness and some of its flavor attributes. If purchasing coffee, only buy enough to be consumed within 1-2 weeks to ensure freshness. If you purchase whole-bean coffee, always grind your beans as close to your brew time as possible. The recommend grind for a paper filter would be at a drip setting to allow for proper extraction. 2) Measure fresh ground coffee into the filter and shake gently to level the bed of grounds. Use 1 rounded tablespoon of coffee for each 6 oz of fresh cold filtered water. To be exact with your measurements use 2 oz of ground coffee per 16 oz of water. 16 oz of water – Use 2 oz or 4 tablespoons of ground coffee. 32 oz of water – Use 4 oz or 8 tablespoons of ground coffee. 18 oz of water – Use 5 oz or 9 tablespoons of ground coffee. Try the above chart and adjust the measurements based on your taste preferences. 3) Measure into the decanter the quantity of cold water you wish to brew. Use filtered, bottled, or clean tap water. The tap water should be free of odors and low in chlorine. 4) Brew according to the drip brewer owner’s manual. 5) Enjoy the cup of fresh roasted and brewed coffee. B. French Press This method is easy, but it requires some simple steps to be followed. This method is accepted worldwide as the best way to brew coffee. 1) Purchase only fresh roasted coffee. When coffee sits unused it loses its freshness and some of its flavor attributes. If purchasing coffee, only buy enough to be consumed within 1-2 weeks to ensure freshness. If you purchase whole-bean coffee, always grind your beans as close to your brew time as possible. The recommended grind for French Press is Coarse Grind for proper extraction. The grind should be large enough so that the mesh filter works freely and does not become clogged. 2) Start with clean utensils. For best results, preheat the glass beaker of the French Press with hot water to maximize heat retention. Remove the lid and plunger. .25 oz of coarse ground coffee per 4 oz cup of water. Try the above recommendation and adjust based on your taste preferences. 3) Boil water to 195-205°F. Don’t let the water boil for more than a few seconds. Once the water has come to a boil, wait 25 seconds before adding it slowly to the pot. When you are done pouring the water, stir with a spoon 5-6 times. 4) The screen should be up against the bottom of the lid. Place the lid on the press. Set timer for 1 minute. Once timer goes off, remove the lid, stir, and replace the lid. Set the timer for 3 minutes. When the timer goes off again, hold the lid with one hand and press the plunger down steadily and carefully. The screen will push the grounds to the bottom of the press. This should take 15-25 seconds. Serve. A study by NIH and AARP of 40,000 older adults showed that regular coffee drinkers were less likely to die from all causes than nondrinkers were. Three cups of caffeinated coffee a day may reduce the risk of Alzheimer’s and dementia in older people with mild cognitive impairment, according to Florida researchers. Muscles recover faster after strenuous exercise if you top off your post-workout meal with several cups of caffeinated coffee, an Australian study found. Methylpridinium antioxidants are found in coffee. This anticancer compound is not found in significant amounts with any other food products. Methylpyridinium is formed during the roasting process from trigonelline, which is common in raw coffee cherries. It is present in both regular and decaffeinated coffee. A variety of studies indicate that people who drink coffee in moderation on a regular basis are up to 80% less likely to develop Parkinson’s disease. Other research shows that drinking at least two cups daily can translate to a 25% reduced risk of colon cancer. 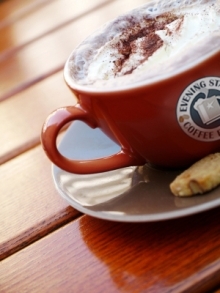 Coffee may help manage asthma and even control attacks when medication is unavailable. Drinking at least two cups daily can translate to an 80% drop in liver cirrhosis risk, and nearly half the risk of gallstones. Coffee consumption may help reduce the risk of oral and esophageal cancer. A link is also found with a reduction in breast cancer. Coffee helps to reduce the effects of headaches, and migraines. Coffee contains caffeine, which is found in over-the-counter headache medications. Coffee helps to boost the mood, and improve cognitive function. Coffee helps to improve endurance performance in long-duration physical performance activities. Coffee helps to reduce the risk for type 2 diabetes. The risk for type 2 diabetes is lower among regular coffee drinkers than among those who don’t drink it. Moderate coffee drinkers are less likely to develop Alzheimer’s disease later in life. Coffee is also a powerful stimulant to prevent constipation. The effect of coffee consumption on the colon is found in both regular and decaffeinated coffee. Practitioners in alternative medicine often recommend coffee enemas for “cleansing of the colon” due to its stimulus of peristalsis. The information above is provided for educational purposes only. The information above is not intended to replace discussions with your healthcare provider. Always consult your physician before changing your consumption of any food or beverage product. Numerous articles and information about the health benefits of coffee can be found online or at your local library. Do some additional research and learn more about the foods and beverages you consume daily.